Here’s a robot infographic I completed recently for a presentation at Northeastern University. 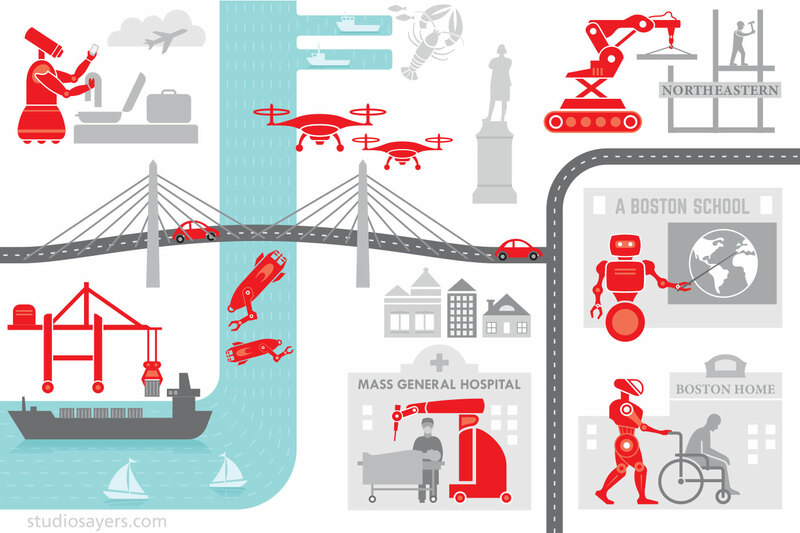 The lighthearted illustration was intended to highlight various potential robotic applications in the Boston area, including maintenance drones performing inspections and repairs on the Tobin Bridge; personal robots empowering residents of The Boston Home; surgical robots assisting surgeons at Mass General Hospital; underwater robots securing the Port of Boston; autonomous lifts unloading shipping containers; collaborative robots inspecting checked bags at Logan Airport; educational robots serving as teacher aides in public schools; construction robots working on the Northeastern facilities; and autonomous cars on local roads. It’s sometimes a nice change to work on an infographic with fewer technical constraints, so thanks to Professor Taskin Padir for the fun project!